This article has a long, varied history. It began life as an e-mail to a friend. Then, at his suggestion, I posted it to RMIC. Then years later, I was involved with setting up two separate blogs on music. One was of course, envisaged as a collective effort. The other was a solo deal called “Aavartan“. I had originally posted it in the latter. But that venture turned out to be a bit of a non-starter. I suppose reposting the article here is only a natural thing to do. First, some mild self-aggrandisement. My biography of Pt. Bhimsen Joshi, published by Rupa & Co, came out round the beginning of 2004. The reason I mention it is that it has everything to do with the events narrated below. In the course of writing it, I had interviewed Mr. Amar Mishra (who incidentally passed away a couple of months ago). He was instrumental in setting up the ITC Sangeet Research Academy, and was also a close personal friend of Panditji. 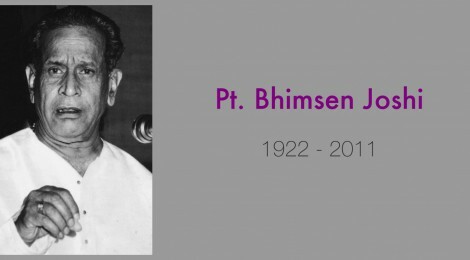 When I heard that Bhimsen was scheduled to sing at the ITC Sammelan in New Delhi this year, I contacted Mr. Mishra to find out if I could get to meet him. Anyway, on the day of the recital, he and I made our way to the green room. Panditji arrived a few minutes later, a frail, shrivelled man with a woollen cap on his head and an air of extreme dejection and bewilderment about him. He was shunted onto a wheelchair and pushed into the green room. Mr. Mishra was busy talking to his other acquaintances, so I went inside, introduced myself to Sh. Srinivas Joshi, Panditji’s son, and showed him a copy of the book. His interest grew when he saw the Rupa label, then he passed it on to his father. I asked him if Panditji could autograph my copy, but he declined, saying his father suffered from weakness in the limbs. That is when Mr. Mishra came in, and introduced me to Panditji. The conversation turned back to the book for a little while. As we were taking our leave, I once again asked Srinivasji if an autograph was absloutely out of the question. He told me to accompany Mr. Mishra the next day (he’d been given an appointment earlier), because if Panditji signed one autograph, others would immediately pile on. The recital, when it began, bore all the signs of a full-scale disaster. Panditji took his time to find his sur. When he began, his voice was so hoarse and shaky one couldn’t discern any notes at all. I’m an avid fan of Panditji’s, but have never really warmed to his interpretation of certain Ragas like Shuddha Kalyan. And I was dreading he’d present just that. Certainly, the singing gave us no clue. For the first three minutes I couldn’t make out anything of the raga, except that the rishabha seemed a bit flat for Kalyan. After a while, the contours of Pooriya began to emerge. Then without warning, he paused abruptly on the pancham, and began “aaj so bana” in Pooriya Kalyan. All was revealed! It took him about ten minutes to fully warm up. But once he did he was roaring like a lion just the way he used to twenty years ago. Vintage Bhimsen every inch. His heavy gamak taans were right there in place, as were all his old tricks, pukars, surprisingly accurate laykari (except for a few miscueings), voice modulations etc. But what really moved all of us in the audience was that he took just as much pleasure in his singing as he did in his prime. His age showed only rarely, such as when he mistimed the ‘sam’ a couple of times. Anand Gopal Bandyopadhyaya on the tabla was very understanding, and skillfully covered up such rare lapses. The Khayal was followed by a Dadra in Mishra Gara, and then “Jo Bhaje Hari Ko Sada” in Bhairavi. I say ‘Followed’, because it was almost the literal truth. He would finish one item, take exactly one long breath, a pause of about fifteen seconds, and proceed to the next one. In a man one-third his age, such a commanding display would have been commendable. At his age and health it was nothing short of a tour de force. The next morning Mr. Mishra and I set off for the Maurya Sheraton, where Panditji was dossed up. The receptionist first refused to give us his room number (citing security reasons) and then, when we explained we had an appointment, refused to let us enter because there was a do-not-disturb sign on his door. We were about to leave in dejection, when I spotted Pt. Ulhas Kashalkar entering the hotel, accompanied by Sh. Madhup Mudgal. I naturally rushed to touch his feet. He recognised Mr. Mishra and asked him if he could help. Made abreast of the situation, he promptly invited us to his room. So the four of us, Mr. Mishra and Madhup Mudgal on the two armchairs, me on the chair by the desk, and UK on the bed, chatted on for the better part of an hour. By this time I had host hope of getting it autographed by Bhimsen Joshi, so I requested Ulhas Kashalkar to sign it instead. He initially demurred, saying he couldn’t sign it before Bhimsenji. I mollified him by saying if I got to meet him in the evening (there was a chance left) I’d get another copy for him to sign. He then cheerfully scrawled his name on the flyleaf, and so did Madhup Mudgal. At this point both Madhup Mudgal and Ulhas Kashalkar decided to meet Bhimsen Joshi, so we all pushed off to his room. Luckily the sign had been removed, so we went in. A few more people were present. Panditji chatted for fifteen minutes, then excused himself, saying he was tired. I went to his son and reminded him of his promise. He first asked me to come at four o’clock and then, when I said I wouldn’t be able to, suggested I leave it be. My face dropped, so he took pity on me and asked me to request the big man himself. Panditji’s response was, “My hands are very weak, so I can only promise to try. Let’s have a go!” And he did sign! I then turned to Ulhas Kashalkar and then said I’d brought a camera but didn’t have the nerve to take pics as Panditji was tired. He said no no, no problem at all, come along. So I made him stand next to Panditji and took a snap of them together. Promptly, Mr. Mishra, Madhup Mudgal and some of the other people present there came up and requested snaps. Someone took pity on me and snapped one of mine with Bhimsen Joshi. We left after that. What a day!